From the Department of Neurology (R.B., A.S.C., Z.X., P.L.D.J., T.C. ), Partners Multiple Sclerosis Center, Brigham and Women's Hospital, Brookline, MA; and Ann Romney Center for Neurologic Diseases (R.B., A.S.C., Z.X., L.C., P.L.D.J., T.C. ), Harvard Medical School (R.B., Z.X., L.C., P.L.D.J., T.C. ), Boston, MA. Objective: To examine the relationship between 2 markers of early multiple sclerosis (MS) onset, 1 genetic (HLA-DRB1*1501) and 1 experiential (early menarche), in 2 cohorts. Methods: We included 540 white women with MS or clinically isolated syndrome (N = 156 with genetic data available) and 1,390 white women without MS but with a first-degree relative with MS (Genes and Environment in Multiple Sclerosis [GEMS]). Age at menarche, HLA-DRB1*1501 status, and age at MS onset were analyzed. Results: In both cohorts, participants with at least 1 HLA-DRB1*1501 allele had a later age at menarche than did participants with no risk alleles (MS: mean difference = 0.49, 95% confidence interval [CI] = [0.03–0.95], p = 0.036; GEMS: mean difference = 0.159, 95% CI = [0.012–0.305], p = 0.034). This association remained after we adjusted for body mass index at age 18 (available in GEMS) and for other MS risk alleles, as well as a single nucleotide polymorphism near the HLA-A region previously associated with age of menarche (available in MS cohort). Confirming previously reported associations, in our MS cohort, every year decrease in age at menarche was associated with a 0.65-year earlier MS onset (95% CI = [0.07–1.22], p = 0.027, N = 540). Earlier MS onset was also found in individuals with at least 1 HLA-DRB1*1501 risk allele (mean difference = −3.40 years, 95% CI = [−6.42 to −0.37], p = 0.028, N = 156). Conclusions: In 2 cohorts, a genetic marker for earlier MS onset (HLA-DRB1*1501) was inversely related to earlier menarche, an experiential marker for earlier symptom onset. This finding warrants broader investigations into the association between the HLA region and hormonal regulation in determining the onset of autoimmune disease. In the current study, we tested the association between HLA-DRB1*1501 and early menarche in 2 cohorts of white women, one with and one without MS. Secondarily, we confirmed the association between each marker and age at first MS symptoms in the cohort of affected women. These participants were patients of the Partners Multiple Sclerosis Center, aged 18 or above, enrolled in the Comprehensive Longitudinal Investigation of Multiple Sclerosis at the Brigham and Women's Hospital (CLIMB, www.climbstudy.org).11 Female participants were included in this study if they met the diagnostic criteria of relapsing remitting MS by the 2005 McDonald criteria12 or of clinically isolated syndrome (CIS). A reproductive questionnaire, which is deployed to all active female CLIMB participants with a diagnosis of MS or CIS, was analyzed after a 60% response rate was achieved (on June 20, 2014), as reported previously.13 Among these 724 respondents, 675 provided an age at menarche. Participants with menarche data were older at first MS symptom than the 486 nonrespondents and participants without menarche data (33.8 vs 32.6 years, p < 0.05), but the groups did not differ in race, ethnicity, disease category, or Expanded Disability Status Scale (EDSS)14 at the most recent visit (p > 0.05 for each). The questionnaire variables included in the current analysis were (1) reported age at menarche and (2) response to whether a participant had “been told you were obese” during childhood and/or adolescence (yes/no). Reproductive questionnaire responses were linked to demographic and clinical data available through CLIMB. Of the 675 participants who provided age at menarche and response to childhood obesity question in the reproductive questionnaire, we identified 540 participants for whom information about (3) residency at age 15 (north/middle/south United States; allowing us to categorize the latitude of residency at age 15 as a proxy for vitamin D exposure) and (4) smoking history (ever smoker/never smoker) was available. Of the 540 participants identified, 156 had genetic data available (see below, and table 1). Individuals with family history of MS. The 1,390 participants without MS were adult female participants in the Genes and Environment in Multiple Sclerosis (GEMS) study. This prospective cohort study was designed to map the sequence of events in the transition from health to MS, by enrolling individuals who have a first-degree relative with a diagnosis of MS.1 At study enrollment, participants complete a detailed demographic, health, and reproductive questionnaire and provide samples for genetic analyses. GEMS participants were excluded from the current study if they themselves carried a diagnosis of MS.
Genotyping and genetic risk score. Genotyping of the individuals with MS15 and GEMS participants1 has been described previously. A genetic risk score (GRS) was designed from a list of 64 validated and replicated single nucleotide polymorphisms (SNPs) that are associated with MS susceptibility2,16 and was the most up-to-date list as of 2011 when targeted genotyping of GEMS participants first began.1 This list of 64 SNPs included 5 within the major histocompatibility complex or human leukocyte antigen (HLA) region (table e-1 at Neurology.org/ng). Each SNP was coded additively by the established risk allele and weighted by the natural log of the published odds ratio for MS susceptibility. The GRS59 refers to the GRS64 without the 5 HLA SNPs. Institutional Review Board approval was granted by the Partners Human Research Committee. All analyses were conducted using the Statistical Analysis System (SAS) 9.3 (Cary, NC). Given the low number of non-white participants (<7%), to mitigate the possible role of ancestry in genetic associations,4,17 only white participants (fewer than 5% of whom identified as Hispanic) were included in this study. We compared the GEMS and MS genetic cohorts, as well as the MS participants with and without genetic data, using a 2-sample t test for continuous variables (ages, GRS), Fisher exact test for disease category, and 2-tailed Mann-Whitney U test for EDSS. In our MS cohort, we first confirmed that the previously reported association between both age at menarche and genetic risk markers, and age at first symptoms, was present. To do this, we performed univariate analysis using a simple linear regression between each predictor (age at menarche, HLA alleles, GRS64, and GRS59) and age at first symptoms. We selected the rs3129889 SNP as our primary SNP, because it refers to the HLA-DRB1*1501 MS susceptibility allele, which has been previously associated with earlier age at disease onset.2,–,4 We examined SNPs in 2 ways; we report analyses examining SNPs as a categorical variable (at least 1 susceptibility allele vs none) using a 2-sample t test; the results were similar when we analyzed alleles as continuous variables (i.e., 0, 1, and 2; table e-2) using a linear regression model. We further assessed the potential confounding effect of reported obesity, latitude of residency at age 15, and smoking history, by including these variables in a multivariate analysis (multiple linear regression) for each of the models. Then, in our primary analysis, we assessed the association between genetic risk markers (HLA alleles, GRS64 and GRS59) and age at menarche in both cohorts using multiple linear regression models. Here again, the rs3129889 SNP was our primary SNP. Because 1 HLA-A allele has previously been found to be associated with menarcheal age in a large genome-wide association study (GWAS) through the rs16896742 SNP, which is near HLA-A,18 we further adjusted our analyses for rs16896742 (available in the MS cohort). Finally, we also adjusted for reported body mass index (BMI) at age 18 (available in the GEMS cohort). In our 2 cohorts of women, age at menarche was similar (12.6 and 12.7). As expected, the 156 women with MS had a higher GRS64 and GRS59 and were more likely to carry an HLA-DRB1*1501 risk allele, than were the 1,390 women in the GEMS cohort. The MS women also seemed to be older than the women without MS (table 1). Among the participants with MS, the 156 participants with genetic data available did not differ from the 384 participants without genetic data in terms of age at menarche (2-tailed t = −0.60; 95% confidence interval [CI] = [−0.35 to 0.18]; p = 0.55), age at first symptom (2-tailed t = 1.19; 95% CI = [−0.71 to 2.88]; p = 0.23), or EDSS at last visit (Mann-Whitney U test = 31; p = 0.11). However, there were no women with CIS among the genotyped population, likely reflecting inclusion criteria for genotyping (table 2). First, we confirmed that both the HLA-DRB1*1501 risk allele and age at menarche were associated with earlier age at first MS symptoms in our cohort of affected women (CLIMB). The presence of at least 1 HLA-DRB1*1501 allele was associated with earlier age at first symptoms (mean difference = −3.40, 95% CI = [−6.42 to −0.37], p = 0.028, N = 156). No association was found between any of the other 4 HLA alleles, or the overall genetic risk score GRS 64, and age at first symptoms (p > 0.10 for each). 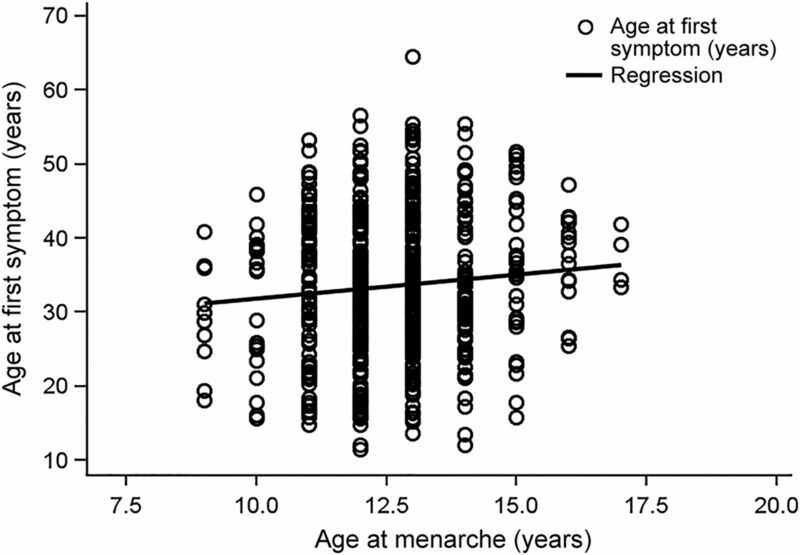 Earlier age at menarche was also associated with earlier age at first MS symptom (figure 1). Specifically, the mean age at first symptoms was increased by 0.65 years for every 1-year increase in age at menarche (mean = 0.65; 95% CI = [0.07–1.22], p = 0.027, N = 540). This association remained (mean = 0.63; 95% CI = [0.05–1.21], p = 0.033) after we adjusted for 3 potential confounders (latitude at age 15, smoking history at first symptom, and obesity status in childhood or adolescence), none of which was significant in the multivariate model (p > 0.05 for each). Then, we ensured that the associations observed in the entire cohort were similar in the subset of participants with genetic data. We still observed that age at MS onset increased with increasing age at menarche, adjusting for the potential confounders. Specifically, for every 1-year increase in the age at menarche, the mean age at first symptoms increased by 0.35; but in the reduced sample of participants, this association was no longer significant (mean = 0.35; 95% CI = [−0.69 to 1.39]; p = 0.51; n = 156). Genetic risk and age at menarche in 2 cohorts. Because both earlier menarche and genetic risk have previously been associated with earlier age at first symptoms, we sought to understand the association between menarche and genetic risk. Surprisingly, in our discovery cohort of women with MS, participants with at least 1 HLA-DRB1*1501 allele had a later age at menarche than participants with no risk alleles (2-tailed t = 2.12, 95% CI = [0.03–0.95]; p = 0.036; table 3). In the replication cohort of individuals without MS but with at least 1 first-degree relative with MS (GEMS), this was also true (2-tailed t = 2.15, 95% CI = [0.01–0.31], p = 0.032; table 3). When we combined the discovery and replication cohorts, having at least 1 HLA-DRB1*1501 risk allele was associated with a later age at menarche (2-tailed t = 2.69, 95% CI = [0.05–0.33]; p = 0.007). When the cohort effect was accounted for as a categorical variable in the regression model, our results remain unchanged (mean difference = 0.17; 95% CI = [0.04–0.31]; p = 0.011). When we examined other genetic markers, a higher GRS64 score was also associated with later age at menarche in the individual and combined cohorts (p < 0.05, table 3). However, this was likely driven by the HLA-DRB1*1501 allele because there was no association between any of the other HLA alleles, or of the GRS59 (GRS64 without HLA SNPs), and age at menarche in either cohort (p > 0.10 for each analysis). In sensitivity analyses, we addressed the possibility that the HLA-DRB1*1501 effect was driven, through linkage disequilibrium (LD), by another SNP, namely, an HLA-A allele previously found to be associated with menarcheal age in a large GWAS (through the proxy rs16896742 SNP18). When we further adjusted our analyses for rs16896742 in the MS cohort, the association between HLA-DRB1*1501 and later menarcheal age remained (mean = 0.49, 95% CI = [0.03–0.95], p = 0.037). In addition, in the GEMS cohort, for whom BMI at age 18 was available, with higher BMI itself associated with earlier age at menarche (mean difference = −0.07 years; 95% CI = [−0.08 to −0.05]; p < 0.0001, N = 1,388), adjusting for BMI at age 18 did not change the significance of the association between HLA-DRB1*1501 and age at menarche (mean difference = 0.1538; 95% CI = [0.029–0.278]; p = 0.015; N = 1,388). Altogether, a summary of the directionality of the findings between HLA-DRB1*1501, age at menarche, and age at first symptoms is represented in figure 2. Presence of HLA-DRB1*1501 multiple sclerosis risk allele is associated with later age at menarche, which in turn is associated with later age at first symptoms. Presence of the HLA-DRB1*1501 risk allele is associated with earlier age at first symptoms. A significant association/difference (p < 0.05) is represented by an asterisk (*). A positive association is represented by a plus sign (+) and a negative association by a negative sign (−). In this analysis of a well-phenotyped cohort of women with MS, both earlier age at menarche and an established genetic risk factor for MS, HLA-DRB1*1501 status, were associated with earlier onset of MS symptoms. However, when we examined the association between HLA-DRB1*1501 status and age at menarche, in both a cohort of women at increased genetic risk for MS and our clinical cohort, this risk allele was associated with a later age at menarche. Given such previous reports of synergistic associations between genetic and experiential factors in determining MS risk,10 we asked whether established MS genetic risk alleles, previously found to be associated with age of MS onset (for both HLA-DRB12,–,4 and broader genetic risk variants33,34), might underlie or enhance the association between menarcheal age and age of MS onset. We found a statistical trend between genetic risk factors for MS and earlier age at MS first symptoms, consistent with one previous report.9 Because there was no association between menarcheal age and age at MS onset in another large study,6 further cohorts are required to validate our observations and to assess the role of regional or epochal differences in menarcheal age and delay in MS diagnosis. Although the association between menarcheal age and symptom onset was expected, it was unexpected that an MS risk allele would show an association with later (rather than earlier) menarcheal age. The presence of HLA-DRB1*1501 was associated with later age at menarche, which in turn is associated with later age at MS onset. There are few previous reports linking HLA alleles and menarcheal age.35 Given the recognized extent of LD in the HLA region on chromosome 6,36 one possible explanation for our finding might be that an allele in LD with HLA-DRB1*1501 might drive the apparent association between HLA-DRB1*1501 (which is in this scenario neutral) and later menarcheal age, even as other environmental factors are driving a relationship between earlier menarche and MS risk. However, we found no evidence that the other MS HLA risk alleles included in our GRS, or that an SNP near the HLA-A region previously found to show a genome-wide association with age of menarche,18 mitigated the association between HLA-DRB1*1501 and menarcheal age. Our findings hint at previously unexplored associations between immune regulation and pubertal timing, warranting not only replication in other data sets but also clarification of whether HLA-DRB1*1501 or an allele in LD with HLA-DRB1*1501 is driving the association with menarcheal age, as well as mechanistic explorations of the genetic and epigenetic regulation of immune activity during the pubertal transition. The largest limitation of this study was that adiposity during the adolescent years was only incompletely captured for the MS participants; however, in the GEMS cohort, we were able to verify that the association between HLA status and menarcheal age was not influenced by BMI at age 18. The second limitation was the statistically significant, but minor in absolute terms, respondent biases in the reproductive survey. If respondents were older at MS onset than nonrespondents, they may have been less likely to have early menarche and to carry HLA-DRB*1501 risk allele; it is possible that with a higher response rate, we would have observed even stronger associations between genetic risk and menarcheal age. Third, only a subset of our participants had genetic data available for analysis, limiting the interpretability of data in the wider cohort of women and for women who are not white. The findings in this study lend complexity to the analysis of early risk factors for MS onset, suggesting a more complex interplay between genetic risk factors and hormonal exposures in the development of inflammatory disease. Study concept and design: R.B., T.C. Statistical analysis and interpretation of data: A.S.C., L.C. Acquisition of data and interpretation of results: R.B., Z.X. Manuscript drafting and revising: R.B., A.S.C., L.C., Z.X., P.L.D.J., T.C. This work was supported by the National Multiple Sclerosis Society (grant RG-4256A4/2 to T.C. ), the National Multiple Sclerosis Society/American Brain Foundation (Clinician Scientist Award FAN 1761-A-1 to R.B.) and the NIH (grant 5K12HD051959-09 BIRCWH Scholar Award to R.B.). Dr. Bove has received research support from NIH, Brigham and Women's Hospital BWPO, UCSF, the National MS Society-American Brain Foundation Clinical Scientist Grant, and the NMSS Career Transition Award. Ms. Chua reports no disclosures. Dr. Xia has served on the editorial board of Neurology® Neuroimmunology & Neuroinflammation; and has received research support from NIH. Dr. Chibnik has received research support from NIH/NIA. Dr. De Jager has received research support and speaker honoraria from Biogen Idec, Pfizer, and TEVA; has received consultation fees from/served on the scientific advisory boards of TEVA Neuroscience and Genzyme/Sanofi; has served on the editorial boards of the Journal of Neuroimmunology and Multiple Sclerosis; and has received research support from Biogen Idec, GlaxoSmithKline, Vertex, Genzyme/Sanofi, and the National MS Society. Dr. Chitnis has received personal compensation for advisory board/consulting for Biogen Idec, Merck-Serono, Novartis Pharmaceuticals, Genzyme/Sanofi, Genentech-Roche, and Alexion; and has received research support from Merck-Serono, Novartis Pharmaceuticals, Biogen Idec, Verily, the National Multiple Sclerosis Society, the Peabody Foundation, the Consortium for MS Centers, and the Guthy-Jackson Charitable Foundation. The authors report no conflicts of interest relevant to this manuscript. Go to Neurology.org/ng for full disclosure forms. The authors thank the patients participating in the CLIMB and GEMS studies who contributed their data and time to this project. The authors thank the following colleagues at the Brigham and Women's Hospital: Emily Greeke and Grace Little for their administration of the questionnaires, Mariann Polgar-Turcsanyi for her role in managing the Partners MS Center research database, as well as Nafiseh Alsharif, Breonna Mabry and Taylor Saraceno for their research assistance. Accepted in final form June 17, 2016. GEMS project: a platform to investigate multiple sclerosis risk. Ann Neurol 2016;79:178–189. Genetic risk and a primary role for cell-mediated immune mechanisms in multiple sclerosis. Nature 2011;476:214–219.
. HLA-DR15 is associated with lower age at onset in multiple sclerosis. Ann Neurol 2000;48:211–219. Modification of multiple sclerosis phenotypes by African ancestry at HLA. Arch Neurol 2009;66:226–233.
. Role of puberty in multiple sclerosis risk and course. Clin Immunol 2013;149:192–200. Age of puberty and the risk of multiple sclerosis: a population based study. Eur J Neurol 2009;16:342–347.
. A case-control study of multiple sclerosis. Neurology 1989;39:825–829.
. Assessing the risk factors for multiple sclerosis in women of reproductive age suffering the disease in Isfahan Province. Int J Prev Med 2016;7:58.
. The relation between menarche and the age of first symptoms in a multiple sclerosis cohort. Mult Scler 2006;12:333–339. Interaction between adolescent obesity and HLA risk genes in the etiology of multiple sclerosis. Neurology 2014;82:865–872.
. A model for the comprehensive investigation of a chronic autoimmune disease: the multiple sclerosis CLIMB study. Autoimmun Rev 2006;5:532–536. Diagnostic criteria for multiple sclerosis: 2005 revisions to the “McDonald Criteria.” Ann Neurol 2005;58:840–846.
. Exploration of changes in disability after menopause in a longitudinal multiple sclerosis cohort. Mult Scler 2016;22:935–943. HLA B*44: protective effects in MS susceptibility and MRI outcome measures. Neurology 2010;75:634–640. Genome-wide meta-analysis identifies novel multiple sclerosis susceptibility loci. Ann Neurol 2011;70:897–912. MS in South Asians in England: early disease onset and novel pattern of myelin autoimmunity. BMC Neurol 2015;15:72. Thirty new loci for age at menarche identified by a meta-analysis of genome-wide association studies. Nat Genet 2010;42:1077–1085.
. Menarche, oral contraceptives, pregnancy and progression of disability in relapsing onset and progressive onset multiple sclerosis. J Neurol 2012;259:855–861.
. Menarche increases relapse risk in pediatric multiple sclerosis. Mult Scler 2016;22:193–200.
. Nongenetic determinants of age at menarche: a systematic review. Biomed Res Int 2014;2014:371583.
. Link between body fat and the timing of puberty. Pediatrics 2008;121(suppl 3):S208–S217. Genome-wide association and longitudinal analyses reveal genetic loci linking pubertal height growth, pubertal timing and childhood adiposity. Hum Mol Genet 2013;22:2735–2747. Association of adiposity genetic variants with menarche timing in 92,105 women of European descent. Am J Epidemiol 2013;178:451–460.
. Body size and risk of MS in two cohorts of US women. Neurology 2009;73:1543–1550.
. High body mass index before age 20 is associated with increased risk for multiple sclerosis in both men and women. Mult Scler 2012;18:1334–1336. Childhood body mass index and multiple sclerosis risk: a long-term cohort study. Mult Scler 2013;19:1323–1329.
. Childhood obesity and risk of pediatric multiple sclerosis and clinically isolated syndrome. Neurology 2013;80:548–552.
. Higher weight in adolescence and young adulthood is associated with an earlier age at multiple sclerosis onset. Mult Scler 2015;21:858–865. Increased leptin and A-FABP levels in relapsing and progressive forms of MS. BMC Neurol 2013;13:172.
. Leptin as a metabolic link to multiple sclerosis. Nat Rev Neurol 2010;6:455–461. Oligoclonal bands and age at onset correlate with genetic risk score in multiple sclerosis. Mult Scler 2014;20:660–668. Inverse correlation of genetic risk score with age at onset in bout-onset and progressive-onset multiple sclerosis. Mult Scler 2015;21:1463–1467.
. Rheumatoid arthritis, HLA identity, and age at menarche. Ann Rheum Dis 1993;52:322–326.
. The immunogenetics of multiple sclerosis: a comprehensive review. J Autoimmun 2015;64:13–25.